The reasons for sweatshop working conditions have been understood for decades. Major apparel brands such as Nike outsource production to a constantly shifting network of hundreds or thousands of contractor factories around the world. Cheap prices and fast turnaround times are mandatory, especially in the age of “fast fashion.” This intense pressure on factory owners pushes them to squeeze labor costs. The separation of the brand/buyer from ownership of the contractor/factory is a business model that goes back 100 years in the garment industry and serves to shift risk down the supply chain and evade responsibility for sometimes terrible consequences. There’s plenty of money in the system to pay for a wage increase and other improvements. All the workers together in a factory production line that work on an article of clothing typically make less than 1% of the retail price. Thus workers’ wages could double or triple, which is what would be needed for a living wage, and most consumers wouldn’t notice the increase. Why doesn’t that happen? The workers simply lack bargaining power with respect to the contractors, who themselves are at the mercy of the major brands. The power in these supply chain relationships determines the outcome. Workers are sometimes able to strike and win. A prominent recent example is the 2014 strike of tens of thousands of workers in China at Yue Yuen, the largest shoe manufacturer in the world, where they were able to get back social security payments the company had underpaid for years. But in many cases, workers lack the power to improve conditions on their own, and the environment for organizing is often very dangerous. The sweatshop issue entered the public spotlight in the U.S. about 20 years ago when a group called the National Labor Committee (now called The Institute for Global Labour and Human Rights) published an exposé of sweatshop factories making Kathy Lee Gifford’s clothing line, which famously made Kathy Lee cry on TV. This along with other reports fueled an anti-sweatshop movement that grew largely on college campuses, as students suspected that their high profile universities had some leverage over apparel licensing companies, and that students could push their schools to do something about this issue. I got involved back then while a graduate student at the University of Michigan, and helped start the campaign that challenged the University’s multi-million dollar athletic apparel contract with Nike. Our activities at the time included handing out flyers around campus. 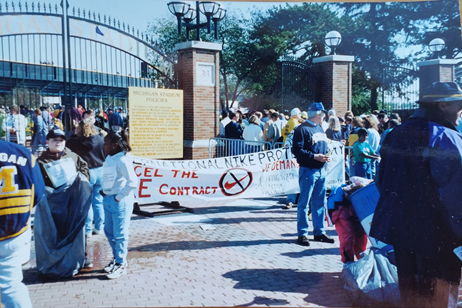 On an international day of action against Nike in 1997, several dozen members of our coalition protested with a huge banner outside a Michigan football game as 100,000 people streamed past us. A few union guys came up to shake our hand. Someone in the distance yelled “get a job,” which made no sense since this was a Saturday, he also wasn’t working, and I had a job. But the best part of this day was that a team of young women dressed in identical Nike gear were handing out pro-company information. I went to chat with them and they asked me who I was working for, as if someone couldn’t do this solidarity work out of a sense of social justice. In any case, this was a great development since it meant that Nike knew we were agitating on campus and felt they had to respond. I also presented comments at Board of Regents meetings; we invited speakers to campus to talk about sweatshops; and we held rallies on the central quad with a giant paper mâché sneaker signed by hundreds of students. About a year later, several dozen members of our group occupied the University President’s office for 51 hours . Subsequently the University began to address the issue. Colleges are generally soft targets, and enough student and faculty pressure can force administrators to offer concessions. Students formed the key solidarity activist group United Students Against Sweatshops in the late 1990’s, which spread to dozens of campuses, with demands that included the disclosure of apparel factory names and locations, and decent working conditions including a living wage for the workers. Other groups such as the International Labor Rights Forum (ILRF) have also engaged in solidarity work by publicizing sweatshop working conditions and pressuring apparel brands to take action. The movement also set up some important institutional infrastructure such as the Worker Rights Consortium, which is the main independent factory monitor on behalf of almost 200 colleges and universities. Similarly, the Sweatfree Purchasing Consortium acts to coordinate sweatshop-free apparel purchasing among a network of cities and states. Counterpart ally groups in other countries include the Maquila Solidarity Network in Canada and the Clean Clothes Campaign in Europe. There are other solidarity groups for workers in other industries such as food and electronics, where similar issues prevail. The industry response has been to set up Corporate Social Responsibility (CSR) programs, which generally include a factory code of conduct and monitoring. A key initiative was the formation of the Fair Labor Association in the late 1990’s, which remains a flawed, company-dominated organization. CSR work is based on brief, occasional factory visits by paid third party auditors, often poorly trained, with checklists in hand. It is common for factory managers to clean up before the auditors visit. Double sets of books are kept to hide wage and hour violations. There is usually little to no discussion with workers, and when there is, managers are typically present and even provide translation. Auditing companies would like to report as few problems as possible in order to keep the monitoring contract. Again and again, sweatshop issues have been uncovered in factories that had previously passed CSR audits. Anti-sweatshop activists have often been portrayed by mainstream commentators as naïve or hypocritical consumers who misunderstand free market economics and global trade realities, and through their misguided efforts, would deprive workers in the Global South of much needed jobs. But the movement generally understands all too well how the industry works and takes action because it does something the industry never does: listens to workers. And workers are clear: they need these jobs but want them to be much better. Activists have always understood their role as providing solidarity by bringing attention to the issue in the Global North where the apparel products are sold, so that workers have more space to organize and improve their working conditions. Thus they apply consumer pressure as a supplement to worker organization. Typically this is done using social media campaigns, producing reports on sweatshop working conditions, organizing demonstrations at retail stores, corporate offices and industry fashion shows, cultivating media coverage, and sponsoring garment worker speaking tours. This has generated some very creative events, such as the “sweatshop fashion show,” where activist models walk a runway wearing sweatshop-made clothing and an announcer discusses the conditions under which they were made. Over the years I have been involved in dozens of sweatshop solidarity actions of various kinds, most recently with 99 Pickets, an activist collective and labor solidarity network. Most of these protests are at retail stores. What works really well, and is a lot of fun, is to bring a large noisy group into the store. 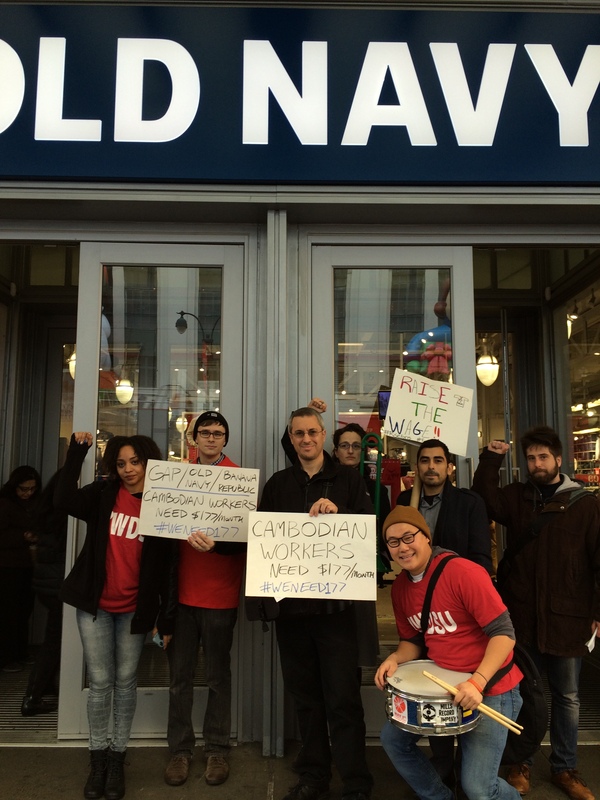 A typical action occurred in New York City recently on December 10th, 2015, when a group of us went into Gap and Old Navy stores during a “day of action” in support of Cambodian garment workers unions, who are campaigning for a minimum wage increase. We wanted the company to support the increase and mandate that their contractors pay that amount. Our group entered the store and as I “mic-checked” for a speech, other members of our group distributed flyers to customers. We also handed a letter to the store manager with our demands. We then marched around the store chanting, while some of us played instruments. Generally the stores are simply not equipped to eject us so we are often able to stay a long time. Management threaten to call the police and if they arrive, we leave. A funny moment occurred when a store manager said to us, “You can say whatever you want but the music has to stop.” They thus conceded our right to yell and scream in their store. These actions have a lot of moments like that. The goal is partly to get information to customers, but really, for the store manager to tell corporate HQ that we were there. If this kind of disruption happens enough, the company may move on the issue. We also publicize the events on social media, to encourage others to take action, and so that workers can see that they happened. Often these days, reports of these kinds of activities are aggregated with a hashtag, for example, #WeNeed177 for the Cambodia campaign. What has the solidarity movement achieved? Given the vast scale and complicated structure of the global industry, the accomplishments so far have been modest but important. The disclosure of factory names and locations is now routine, allowing groups to visit workers and investigate conditions. The widespread establishment of contractor codes of conduct is at least an acknowledgement that brands have some responsibility here. Furthermore, there are a number of cases where solidarity interventions among activists have helped workers improve their conditions and organize unions. A great example is a victory for union workers at Russell factories in Honduras. After a sustained solidarity campaign, the company agreed to reopen a factory and maintain a bargaining relationship with the union covering thousands of workers. Moreover, recently a potential breakthrough in labor rights has occurred in Bangladesh. Apparel is the main export industry and has major ramifications for the country. Bangladesh is also a very dangerous place in which to work and organize unions. In 2012, Aminul Islam, a garment union member and organizer with the Bangladesh Center for Worker Solidarity was kidnapped, tortured and murdered. The perpetrators have still not been brought to justice. 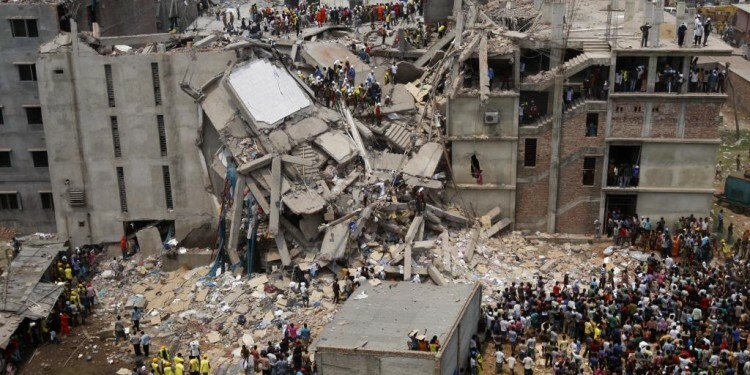 The Rana Plaza factory collapse in April 2013 killed 1,134 workers and injured thousands more in the deadliest disaster in the history of the global apparel industry. Unsafe factories in Bangladesh have been a problem for years. An investigation into product costs in the Bangladesh industry found, in one example, that competitive pressures had reduced factory costs to only 4% of the final retail price of a pair of jeans. An extra ten cents per item on the billions of garments exported annually would be enough to fund factory repairs, but it has been difficult to get that dime from the major brands. However, in the wake of the Rana tragedy, Bangladeshi unions and supporters organized to form the Accord on Fire and Building Safety in Bangladesh, and succeeded in pressuring over 200 companies to sign on. Movement-based groups also managed to secure a $30 million Rana Plaza Compensation Fund for injured workers and victims’ families, a historic achievement. 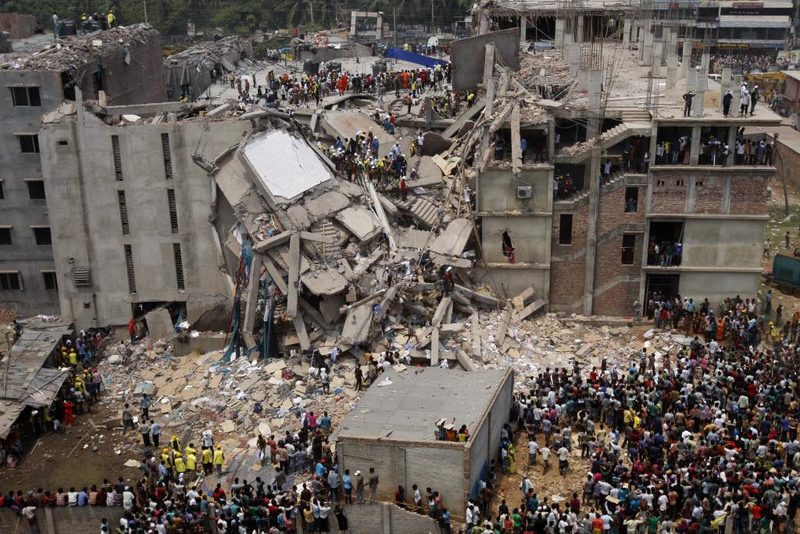 Meanwhile, true to form, a number of major retail and apparel companies such as Walmart and Gap formed a separate Alliance for Bangladesh Worker Safety, a company-run initiative with no meaningful role for workers and unions. I took part in a number of actions to pressure Children’s Place, a brand that was producing at Rana Plaza, to contribute more to the Compensation Fund. They had contributed $450,000 and it was estimated that they should pay millions more. Aside from many demonstrations at their retail stores in New York City, our group visited the CEO’s house in New Jersey, and held a “die-in” at the corporate headquarters in Secaucus during the company’s annual meeting, where we lied down wrapped in white sheets until we were kicked out. Later on about 20 activists, including Kalpona Akter of the Bangladesh Center for Worker Solidarity and Mahinur Begum, a Bangladeshi garment worker who survived Rana Plaza, visited the headquarters again and were arrested . The presence of the Bangladeshis created added drama as the arrest for risky for them. 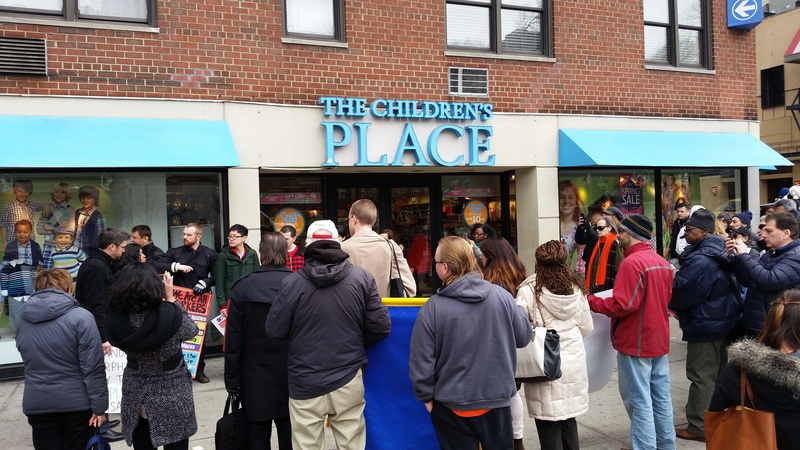 The subsequent negotiations with the company resulted in most of the charges being dropped and Children’s Place eventually raised their Fund contribution to $2.5 million. This was a great example of workers and supporters winning something by acting cooperatively. The Bangladeshis couldn’t do this protest by themselves — they needed the protection of U.S. allies. But the U.S. supporters wouldn’t have been as effective alone. Together we were more powerful. The Accord is the first legally binding agreement between apparel brands and unions where companies are obligated to pay for contractor factory upgrades. It potentially covers over 1,600 factories employing over 2 million workers. Elements of the Accord include an independent factory inspection program which involves workers and unions, public disclosure of all factories, inspection reports and Corrective Action Plans (CAP), a commitment by signatory brands to provide funds for remediation and to maintain sourcing relationships, democratically-elected health and safety committees in all factories, and worker training programs, complaints mechanisms and the right to refuse unsafe work. How has the Accord turned out? The current Accord Progress Overview shows that as of December 2015, 1,358 factory Corrective Action Plans have been published, and 1,600 out of 1,660 factories have been inspected so far. Nearly 100,000 electrical, fire and structural violations have been identified and about 20,000 have been fixed. However, most of the factory CAPs are behind schedule. Still there is some progress here. Workers report they will not be safe without a voice at work. Fire, electrical, and structural safety in garment factories is essential and will save lives. But these renovations and repairs must be the foundation for additional reforms that address the intimidation and violence that keep workers silent, afraid to voice concerns and put forward solutions to ensure their own safety. The Bangladesh Accord represents a kind of industry-wide, multi-employer collective bargaining agreement, and is without a doubt a major step forward in this dismal business. It has its drawbacks, however — for example, it does not cover wages, which are extremely low in Bangladesh. Could the Accord expand to cover other issues? Is this a model that should be brought to other countries? Most importantly, will this create more space for workers to organize in some safety and security? Or will it eventually become a top-down agreement on paper with little input from workers, as so many codes of conduct have become? I have written previously how a global agreement of this kind could be organized with workers and supporters acting together in the ways I have described here. Of course we must consider the limits of this approach if it relies on significant activist/consumer solidarity. 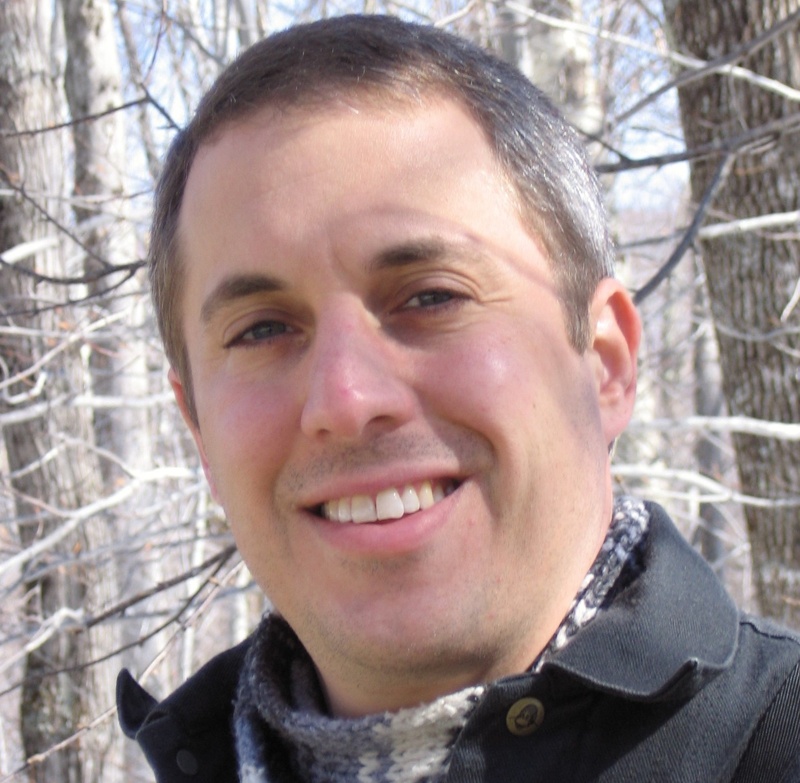 For dramatic improvements we may need millions of people to take action of some kind, but we must admit that many consumers like low apparel prices, and though they may not approve of sweatshop conditions, the factories and workers may be sufficiently distant that they simply will not be moved to take action. Moreover, as I have argued elsewhere, in a critique of fair trade “social labels,” improved conditions for workers should not depend on the whims of relatively wealthier consumers. Ideally, Global North workers in the apparel supply chain, for example at warehouses and retail stores, would take action along with their colleagues in the Global South factories to improve conditions throughout the system, but this kind of cooperative disruption is too rare. There are some examples. Years ago, when I worked for the apparel and textile workers union UNITE, we won several successful organizing campaigns with the stipulation that the companies address labor issues in their factories. But the majority of major apparel and retail company facilities in North America are non-union, thus this approach also has its challenges. There may be more possibilities in Europe where the labor movement is stronger. In any case the workers themselves are the main enforcers of the Accord, through their collective voice and activity, while their allies act in solidarity. We all know that more empowered workers could have prevented the Rana Plaza disaster, just as workers could have prevented the 146 deaths from the infamous Triangle Shirtwaist Factory fire in New York City in 1911, had they been organized at the time. The garment workers in the U.S. eventually formed unions that raised wages and made the industry safer. This global industry, if restructured appropriately with more bargaining power for workers, could cease to be “a life of fines and beating” and provide better jobs for millions.